Back in the good old days of incandescent lighting you went to the store, you bought a 60-watt bulb, and you installed it wherever it was needed. It truly seemed that simple. Today the 60-watt bulb doesn’t exist, lights are all different colors, and prices are all over the board. How do you know what works for you? Learning these 5 things to look for when purchasing LED bulbs can keep you from making multiple trips to the hardware store to replace that one darn bulb. Purchasing LED lights is most confusing when you are replacing traditional incandescent lights. You have to replace a 60-watt bulb, but that same nomenclature isn’t used for LED bulbs. 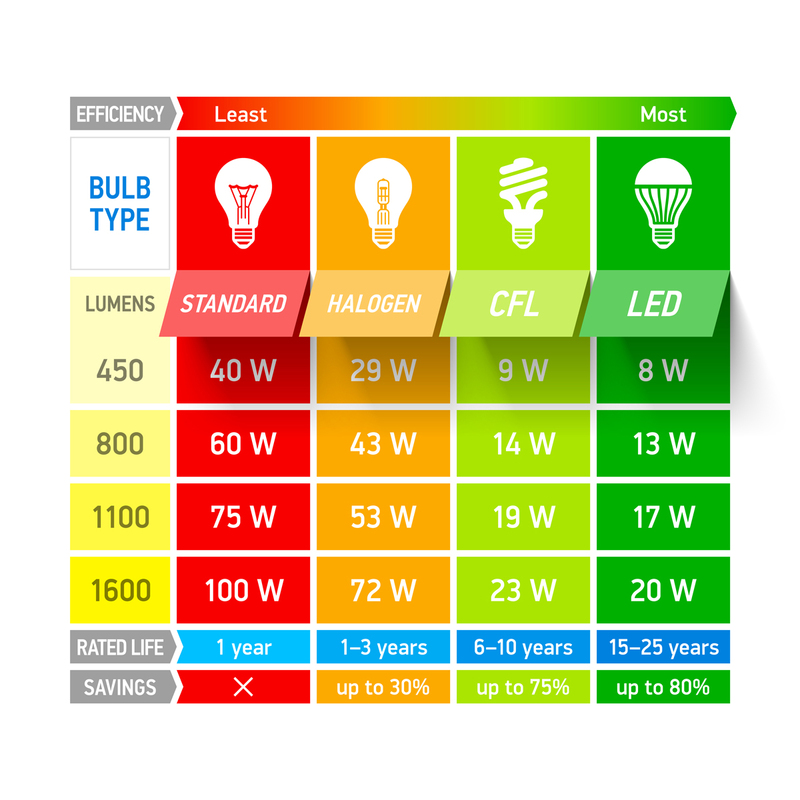 Incandescent bulbs were rated by the amount of energy that they consumed, but LED and CFL bulbs are rated by the amount of light they emit, typically stated in lumens. Luckily, you don’t need to memorize conversion ratios, most manufacturers tell you what wattage a given bulb would be a suitable replacement for right on the box. LED bulbs are FAR more efficient than their incandescent counterparts, and they can last as much as 50x longer, making them a much "greener" option. The only downside is the initial purchase price, as LEDs tend to cost more than comparable incandescents. Probably the most important decision you have to make when standing on the lighting aisle is the color temperature of your bulbs. Color temperature, in simple terms, means what color the light emitted by the bulb will appear. Color temperature is measured in degrees Kelvin. A lower number means that the light will appear more yellow (or warm) and a higher number indicates that the light will appear more blue. 5000° is generally considered the color temperature for sunlight, while 2700° is similar to a traditional 60-watt incandescent bulb. For the most part 2700° - 3500° is ideal for a home. Warmer bulbs within that range can be used for lamps and living spaces, while cooler bulbs work well for task areas like kitchens, bathrooms and garages. While a daylight equivalent bulb sounds like a great idea (who doesn't like a bright sunny day?) the looks is too blue for most people, unless being used for specific tasks like sewing, reading, model building, etc. CRI stands for Color Rendering Index, a value assigned to describe the ability of a light source to faithfully reveal the true colors of an object. High CRI bulbs are essential for merchandising products like clothing, produce and artwork. Within the home high CRI light can make your fruit look fresher and can help you determine if that sock is black or navy. CRI is not a perfect science, but purchasing a bulb with a CRI of 90 or higher will tend to produce a better, more natural, appearance to your artificial light. Your traditional “60-watt light bulb” is an A2 base bulb. A 6” recessed can light typically contains an R30 or R40 bulb. Knowing which bulb you are looking for can be tough, but it isn’t impossible. 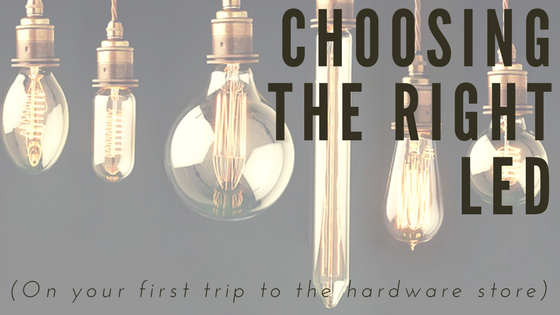 The best way to make sure you get the right bulb is to take your old bulb with you to the store, or in new construction, check the specifications of the fixture receiving the bulb. 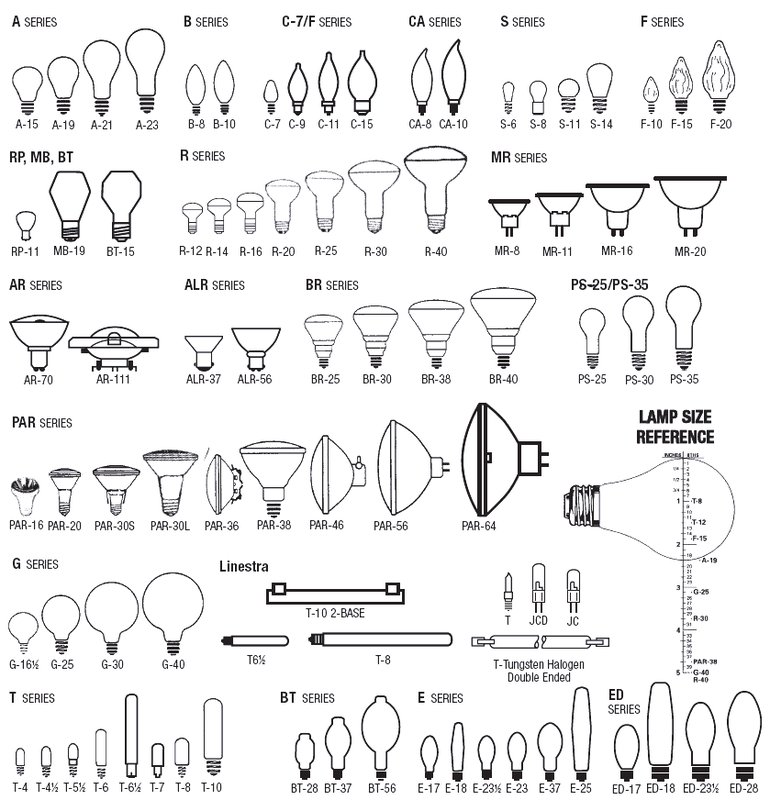 The chart below shows some of the most common lamp types and lets you see how they compare with similar style bulbs. The last important detail when purchasing energy efficient bulbs is checking see whether or not they are dimmable. Incandescent lights dim beautifully as an inherent result of their design. The same can not be said for LED and CFL bulbs. Always check to see if LED bulbs are dimmable, and if possible, ensure they are certified to work with the dimmer type you possess. Even if you don’t currently have a dimmer installed, I would recommend purchasing dimmable lights. Since the bulbs can last up to 30-years there is a chance you may want to add dimming at some point, and waiting for your old non-dimmable bulb to burn out isn’t a viable option. So there you have it, your crash course in purchasing LED bulbs. If you have any questions, don’t hesitate to contact us at info@avinnovations.net or by calling our office at 972.529.4470.